" Since I work with older adults, this was very useful, especially the foam roller exercises. Mary Bowen has a lovely style. " " It was wonderful to hear wisdom from a Pilates elder and to see Mary\'s approach. I certainly concur on the importance of releasing the spine and finding length as the basis for all one does. I also really enjoyed learning the chin exercise. " " I think Mary Bowen is a remarkable teacher with a great sense of humor!! I hope to be able to work with her in person one day. In the meantime, I will find and watch all her workshops. Thank you Mary for your integrity and healthy body movement. " 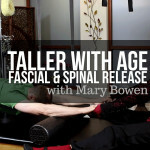 " It was absolutely intriguing and informative learning from the Pilates elder, Mary Bowen. Thank You "
Ellen L Since I work with older adults, this was very useful, especially the foam roller exercises. Mary Bowen has a lovely style. Elizabeth D It was wonderful to hear wisdom from a Pilates elder and to see Mary\'s approach. I certainly concur on the importance of releasing the spine and finding length as the basis for all one does. I also really enjoyed learning the chin exercise. judith j I think Mary Bowen is a remarkable teacher with a great sense of humor!! I hope to be able to work with her in person one day. In the meantime, I will find and watch all her workshops. Thank you Mary for your integrity and healthy body movement. Penny M I really enjoyed this workshop!! I choose this particular workshop because the average age of my clients is around 67 & also, I thought it would be interesting to meet Mary Bowen. Well, now I'm absolutely in love with Mary Bowen. What a Joy!!! Sweet, Charming, Adorable, such a comforting voice - I could listen to her teach all day long. Besides Mary's lovely personality I enjoyed a her approach to the gentle, easy movements of the spine. I've got some nice material for my teaching. Thanks! Gianine D AMAZING. Mary Bowen is so informative and intuitive as to how and why we hold ourselves in certain ways and how to let the body lead us out of bad holding patterns. Also very, very funny.